Mr. Gore stuck his head back in the door after leaving for work. “Okay!” I brightly responded. We had been watching loads of television during an otherwise uneventful summer week; it would be nice for all of us to get some fresh air. 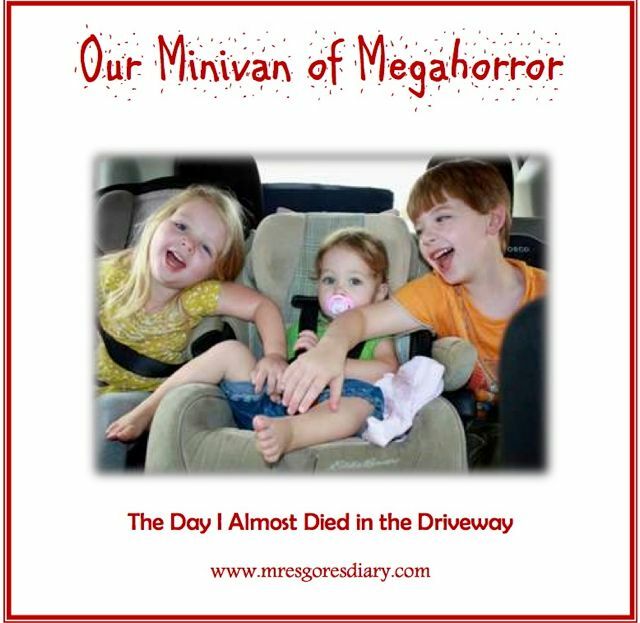 Within 30 minutes time, the kids were all engaged in outdoor pursuits, and I was pulling our minivan into the shade, an arsenal of cleaning aids sitting expectantly beside me in the passenger seat: trashbags, Windex, paper towels, Lysol wipes, old rags, and a little bowl of hot, soapy water. I opened up both front doors. Not bad. I had gathered up most of the trash from our area while Mr. Gore ran inside the grocery store for me the day before. I moved to the back of the van and opened up the hatch. Boxes of toys and bags of old clothes intended for the storage unit (i.e. garage sale pile) hung in midair, threatening to fall out, and our folding chairs were sticking up at jagged angles on every side. Even though I knew all this stuff was back here, I sighed. The giant plastic bowl of cereal trail mix Gideon had made for his Papa in Sunday School on Father’s Day lay opened, upside-down and empty, meaning the sticky cereal pieces were scattered in heaps all over the floor of the backseat. The kids had immediately spilled it on our way home from church that day, and, too exhuasted to deal with it, we left it there and just told them to tiptoe around it. Turns out, every time we are pulling up into our driveway, we are always too exhausted to deal with it. So there it still sat, partly melted into the carpet, mocking me with its sugary coating and voluminous girth. That was a big ol’ plastic bowl of trail mix! Speaking of carpet, WHY do minivans have carpet?! How about some linoleum, or something we could hose down?…you might want to mull that over, Honda. I sighed and frowned at the cereal with my mean, pregnant face. Moving on. I opened the last sliding door, and the fact that a decently cool breeze was blowing through the van gave me a fair amount of optimism. I unbuckled Betsie’s chair from the front row seat and pulled it out. erase this from my memory, please. and forgive me for not taking care of our life. The seat beneath her chair was littered with all manner of snacks and debris, and I quickly learned what had happened to all of her missing hairbows. It was horrifying. And I still had two booster seats to go, from the dreaded back row. I quickly reached back and pulled them out, not daring to look at the aftermath. And then I got right to cleaning, starting with my seat, passenger front. I windexed my window. I sprayed down my door and wiped it off. I polished the glovebox. Then I noticed the dust-covered dashboard, the end of which seemed very far away from my 8-months pregnant belly. I scooted myself up as far as my belly would allow, turned my face to the side, closed my eyes, and reached as far as I could, hoping I was eradicating all traces of dirt. I opened my eyes. I did it! It was clean! But now there was a definite line showing how little I had accomplished. My little spot in the van might be very tidy, but the only thing that was doing for me at the moment was revealing how terribly filthy the rest of the crime-scene-on-wheels was. I decided to start removing all those floor mat thingys. For some reason, our van has like, 50. And all 50 of them were covered in grass and pebbles and goo and, I don’t know, probably poop. I made quick work of this part, dumping the stuff off of them and tossing them in a row in the sun. I’d hose them off later. Please, oh PLEASE God, don’t let me find a Chicken McNugget. If all those rumors are true that McDonald’s food doesn’t break down, I DON’T want to know it. Ignorance is bliss. Oh, and please don’t let me find a sippy cup. I beg of you. No sippy cups. And no dead mice. If I find a dead mouse…or a live one, for that matter…I am DONE here. I timidly reached under the seats, digging out scraps of paper, empty containers, church crafts, and yes, finally, one McDonald’s box. I didn’t open it. If there was a McNugget in there, I’ll never know if it was moldy like it should be or freakishly well-preserved like it shouldn’t be. Finally, all the trash from the inside was picked up and my Shop-Vac and I got to work. At this point, it actually looked like I had accomplished something, which is just the sort of results Shop-Vacs always bring to the table. Hallelujah. Before I knew it, the driver and passenger area and the first row seat were looking decent and I could actually see the carpet on the floor of our minivan. Yes, it was covered with stains like someone had been murdered in our van and then decomposed there, too, but…you could see it. So that counts for something. Sweating now, I decided to take a break from vacuuming and move to the back hatch. I have this bad habit of boxing things from the house up for our garage sale that never happens, sending it to the car, and then never touching it again. Thus, there was a hole-filled bag of clothes in the back from like, 2010, maybe? And they were covered with dust. If there was a mouse in our van, it was going to be in that bag. I stuck my pinky out and gingerly began removing items of clothing to a heap under a nearby shade tree, shaking out dust, and continuing to pray for no critters or creatures to fall out. I do believe this was the most terrifying part of my van-cleaning experience. There was stuff in that hatch that I had such little remembrance of, I knew it was very possible that there could be a small meal hiding out back there, if not a squirrel family or something truly terrifying, like a clown mask or a bloody knife. That’s when I noticed a little storage door in the side of the hatch. What if there is something weird in there? Like a human head?! What if the person who originally owned this van was a murderer and I’m about to find out??? What if Mr. Gore is the murderer? How will I ever provide for this family if he goes to jail?! But how nice that something in this van is actually CLEAN! Heart beating, I made quick work of the empty hatch, scrubbing down the back of the seats, disinfecting the entire area and vaccumming the carpet. That left one major area to tackle…. (excuse me while I take a deep, cleansing breath and perform a meditative exercise). The den of the ragamuffins. The lair of the hoydens. In other words, Satan’s domain. This is the seat we, as parents, NEVER visit. Ever. Our eldest kids can crawl back there alone now and buckle themselves up, and the only time we see the trainwreck they’ve created is when we reach back to lift out one of their booster chairs for another vehicle and see showers of cereal and dirt and plastic toys come raining down. But we act like we don’t see it. Because then we’d have to clean it. Like I was about to have to do, 8 months pregnant, in Ju-stinkin’-ly, in Okla-hot-homa. Ugh. Lucky Charms? Who had Lucky Charms back here? I leaned to the left and then to the right in order to inspect the windows and side ledges. I need to get out of here!!! I’m about to hyperventilate. I’ve given birth three times. I can CLEAN this. heaven help me, the cupholders were not the same color as the rest of the van’s interior. Rather, they seemed to be coated in…tar, maybe? Mud and dried up Dr. Pepper? Chewing tobacco? After swallowing the bile that had risen to my throat, I Shop-Vac’ed a place for me to sit so I could tackle this nightmare that lay before me. Did I REALLY say I wanted to do this? Windex. Scrubbing Bubbles. Dawn dish soap. And 4 Lysol wipes per cupholder (for a grand total of 16 Lysol wipes). I scrubbed and cleaned and cleaned and scrubbed and shivered and shuddered and cleaned some more. Then I scrubbed one more time. Finally, after two hours and what felt like a walk to hell and back, I was finished. I fell back into the clean seat and just sat there in the hot van, not only unable to move, but unable to process one complete thought. Eventually, like a shell-shocked survivor of a post-apocalyptic event, I managed to squeeze myself back through the tiny seat hallway and stagger into the open air, blinking against the bright sunlight. My thoughts were scattered as I walked barefoot down our steaming, cobblestone sidewalk. Why is it so BRIGHT out here? I bet my house is filthy. My hair was disheveled and sweaty. My cheeks were flushed bright red. But it was my eyes that had changed the most. They were wild…dazed…the bearers of secrets too horrific to fully express. I’m so glad I’m not alone in having a disgusting vehicle destroyed by little ones. My husband complains that our suburban smells like a homeless person is living in there! I absolutely LOVE this post. I am familiar with your horror. Things have never gotten to this point in our car (I raised my kids in the days before we had to have car seats. Just hang on to the door handles, kids.) but we did have a mouse die in our last van. We discovered this when we turned on the a/c. We took the car to the mechanic, and he said it would cost umpty-ump dollars to take apart the dash, because of the airbags. Fortunately, we live where we can leave the windows down at night, so eventually the smell dissipated.